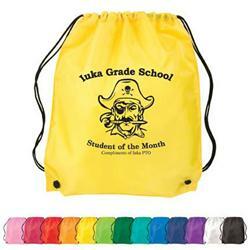 Custom Drawstring Backpacks in a variety of colors with your promotional logo! These nylon cinch bags are easy on the budget and great for wearing over the shoulders or using as a drawstring tote.. Don’t see the backpack you need? Hundreds more styles, quality levels and colors available, call our friendly staff at 888-332-ADCO! 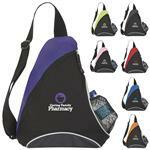 This bag is available in awareness pink - a great promotional item for breast cancer awareness! FREE 1-DAY RUSH PRODUCTION AVAILABLE. ON SPECIAL! Dimensions: 14 1/2" x 17 1/2" x 1/8"
Available Imprint Options: Add $.50 for each additional imprint color.